“This is how the planet’s fiery breath looks,” writes Your Shot photographer Vladimir Voychuk, “when the volcano wakes.” The “blazing glow” of Klyuchevskaya Sopka, considered the tallest active volcano in Eurasia, is visible from more than 60 miles away, according to Voychuk. Klyuchevskaya Sopka is located on Russia’s Kamchatka Peninsula, approximately 60 miles west of the Bering Sea, and towers nearly 16,000 feet at its peak. Actually, yes, they kind of do. Just don’t tell them. 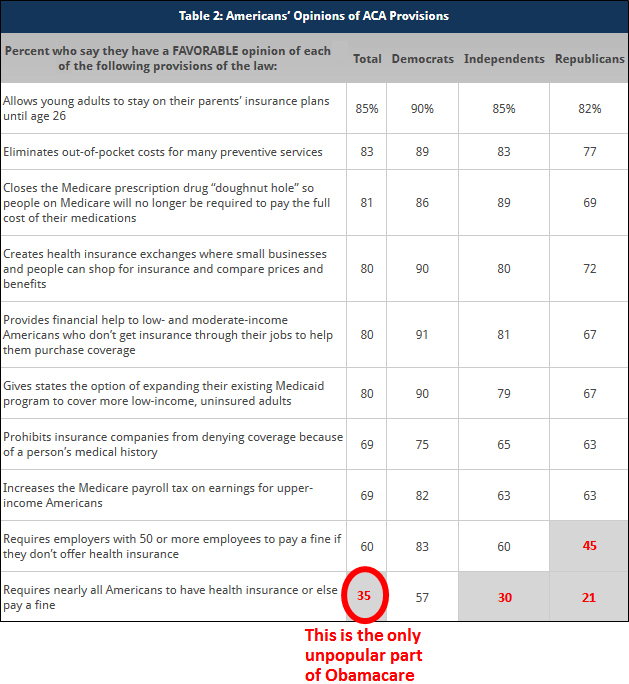 Drum recently highlighted this series of polling results that shows that even Republicans strongly prefer virtually every single aspect of the ACA. Everything, but the individual mandate, of course. And, of course, you simply don’t get the rest of these goodies without the individual mandate (or, some similar regulatory mechanism to insure healthy people are buying insurance). But, hey, let’s just pretend the whole thing is horrible and a massive government takeover because, in part, it helps less wealthy people afford health insurance by raising taxes on wealthy people. Oh the humanity. But Trump is no mere Tammany Hall hack. The norms and constitutional provisions he has either violated or is on track to violate go far beyond “honest graft.” His approach is not mere greasing the wheels — it’s puncturing and slashing the tires. Trump’s rewriting of the rules — refusing to acknowledge that he must divest from his businesses, continuing to keep his tax returns secret, tweeting nuclear arms policy, publicly rejecting the findings of the intelligence community on Russian campaign hacking — is so vast that it has swamped his presidency before he has even taken the oath of office. Defending basic democratic norms and maintaining a strong focus on corruption is the right strategy. Not only is it more likely to work but it is likely to leave our politics in a better place in the end. First, making the fight about entitlements and taxes is only going to reinforce existing partisan divides, at a time when Democrats and Republicans need to figure out how to build alliances to minimize the damage Trump can do to basic norms, rather than reinforcing the divide that Trump exploited in the general election. The only chance of checking Trump’s likely excesses and recklessness is if Republicans step in, as Sens. John McCain and Lindsey Graham have done in response to Russia’s interference in the election and Trump’s apparent willingness to lift sanctions. Other conservative Republicans, outside Congress, have expressed deep misgivings about Trump’s refusal to even acknowledge conflicts of interest or his failure to hold press conferences. The potential for cross-partisan alliances on protecting democratic norms and civil liberties, and preventing corruption, is much broader than on programs. Second, it can be hard to hit Trump on policy because he’s made a long game of being ideologically elusive. 2) Charles Feeney is “the James Bond of philanthropy” and basically the anti-Trump when it comes to giving (i.e., he uses his own money and doesn’t make a big show). Blanton is not saying there’s no such thing as unconscious bias, nor is he arguing that racial discrimination isn’t a deep and abiding problem in American life (though at least one white-supremacist-friendly website has mentioned his research in an attempt to make that case — illustrating how such discussions can be misconstrued). He just thinks that scientists don’t know how to measure implicit bias with any confidence and that they shouldn’t pretend otherwise. “It is such an important problem that it deserves a stronger science,” he says. 3) Andrew Gelman undermines the claim that North Carolina isn’t really a democracy. Among other things, 11 other states actually perform worse. Results Prior to the stand your ground law, the mean monthly homicide rate in Florida was 0.49 deaths per 100 000 (mean monthly count, 81.93), and the rate of homicide by firearm was 0.29 deaths per 100 000 (mean monthly count, 49.06). Both rates had an underlying trend of 0.1% decrease per month. After accounting for underlying trends, these results estimate that after the law took effect there was an abrupt and sustained increase in the monthly homicide rate of 24.4% (relative risk [RR], 1.24; 95%CI, 1.16-1.33) and in the rate of homicide by firearm of 31.6% (RR, 1.32; 95% CI, 1.21-1.44). No evidence of change was found in the analyses of comparison states for either homicide (RR, 1.06; 95% CI, 0.98-1.13) or homicide by firearm (RR, 1.08; 95% CI, 0.99-1.17). Furthermore, no changes were observed in control outcomes such as suicide (RR, 0.99; 95% CI, 0.94-1.05) and suicide by firearm (RR, 0.98; 95% CI, 0.91-1.06) in Florida between 2005 and 2014. Conclusions and Relevance The implementation of Florida’s stand your ground self-defense law was associated with a significant increase in homicides and homicides by firearm but no change in rates of suicide or suicide by firearm. 5) Political Scientist/Economist/noted libertarian Mike Munger takes to the NYT Op-Ed to argue that football need to be more like rugby to be safer. 6) Drum says Democrats need a “show us the replacement” mantra regarding Republicans and Obamacare. Cooper is clearly no Pat McCrory. He has a firm grasp of state government and a willingness to push an agenda that McCrory lacked. The legislature has had four years dealing with a push over. They’ll now have to figure out how deal with a governor who clearly plans to make himself a force in Raleigh. Insurers are warning that a “repeal and delay” plan would create immediate turmoil on the government-run exchanges, many of which are already having trouble attracting more than one or two insurers to participate. Last month, two big trade groups—the American Hospital Association and the Federation of American Hospitals—warned publicly that repealing the A.C.A. could cost hospitals a hundred and sixty-five billion dollars and trigger an “unprecedented public health crisis.” In a letter to Congress on Tuesday, Dr. James Madara, the chief executive of the American Medical Association, said, “We believe that before any action is taken . . . policymakers should lay out for the American people, in reasonable detail, what will replace current policies.” ..
10) Nice summary in Vox of Brian Schaffner’s latest on how racism and sexism drove support for Trump. These voters back Democrats, overwhelmingly. In the 2016 election, Hillary Clinton won 67 percent of self-identified Hispanic Catholics and the vast majority of black churchgoers. She also won 71 percent of Jewish voters and 62 percent of voters who belong to other religious faiths and traditions. She suffered a crushing defeat among white evangelicals—losing them 16 percent to Trump’s 81 percent—and she lost white Catholics by an almost 2–1 margin, 37 percent to 60 percent. Because white Christians are the majority of religious voters, and Clinton lost the majority of white Christians, you could say (as Wear does) that these numbers represent a “religion problem” for Democrats. But then to make that claim, you have to ignore race. You have to ignore that Democrats do extremely well with believers of color, Christian or otherwise. You have to ignore stark social and theological divides between black and white Christians, who historically have not understood politics and the Gospel in the same way. You have to ignore the fact that, in North Carolina, the Democratic Party won the state’s governorship on the strength of a movement rooted in black churches and tied to religious leadership. Most importantly, you have to ignore that Democrats lost the large majority of white voters, continuing a trend that dates back to 1968. 12) Jerome Groopman with the most notable medical findings of 2016. 13) I think I missed this back in November: Alex MacGillis‘ look at poor (white, of course) voters voting against their economic interests. 14) One man’s quest to change the way we die. More power to him because we are awful at this in America.